Centice Corporation announces the launch of NetSenX, a new Raman Spectroscopy Sensor Product that revolutionizes deployment of Raman Sensors in Process Manufacturing, Consumer Goods QA, Pharmaceutical Development and other industries where high throughput and unyielding reliability are requirements of Spectroscopy. While in sensor mode, the NetSenX is a powerful spectrometer with an on-board processing capability for spectra capture and matching but allows a secure user interface to provide direct answers to identification and verification. Centice Corporation, a pioneer in chemical verification and identification using Raman spectroscopy, announced today the launch of NetSenX, a new, low cost Raman spectrometer/sensor product designed for field deployment for identification and verification applications. NetSenX delivers the scientist, field worker, manufacturing manager, or quality control professional a lower cost, mobile platform for leveraging Raman Spectroscopy in commercial applications. The product provides both method development for the discerning scientist and easy to use identification/verification sensor mode for a non-scientist. New innovative design advances place a low cost, on-board computer inside the sensor allowing deployment with secure spectral matching capability. NetSenX is accompanied by software to capture spectra, create target databases for spectral matching and enables the user to lock the reference spectra onto the sensor for field target substance matching. Additionally, any networked user can remotely control, view and manage NetSenX using HTML 5 interfaces from mobile devices. By employing Coded Aperture Raman Spectroscopy in the core design, the sensor is capable of very reliable measurement between samples and industry leading reliability of measurements across sensors. Coded Aperture design advantages include high throughput, large target area, low cost design and fixed aperture reliability. 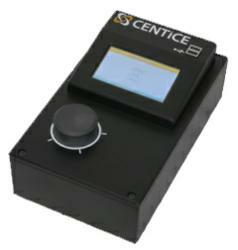 Visit http://www.centice.com\products\NetSenX for additional information and to register to have real-time remote access to a NetSenX spectrometer for verification/identification of a set of substances. Centice Corporation creates and delivers advanced technology solutions to select markets in law enforcement, pharmaceutical manufacturing, healthcare, biotechnology and homeland security. By leveraging an expertise in applied coded aperture spectroscopy, computational sensors, and software architecture development Centice provides technologies and integration expertise that improves lives and protects people’s lifestyles. Centice’s scientists and engineering teams work with a network of partners to answer emerging business and public service needs. Headquartered in Morrisville, N.C. and founded in 2004, the company markets products directly and through distributors. More information can be found at http://www.centice.com.